1919 cover of the Nonpartisan League�s newspaper, The Nonpartisan Leader, portraying �organized farmers and workers� standing tall against big business interests. (Wikimedia Commons). Something I can give thanks for is the many episodes of history Jon has brought to my attention. One of the most relevant for our time, with our desperate need to reform and revitalize the political system of the USA, is the Nonpartisan League of the upper plains states. The NPL gained political control of North Dakota in the 1910s, and created a lasting legacy which includes the only state owned bank in the country; the largest flour mill in the country, also state owned; and the best rate of internet access in the country. 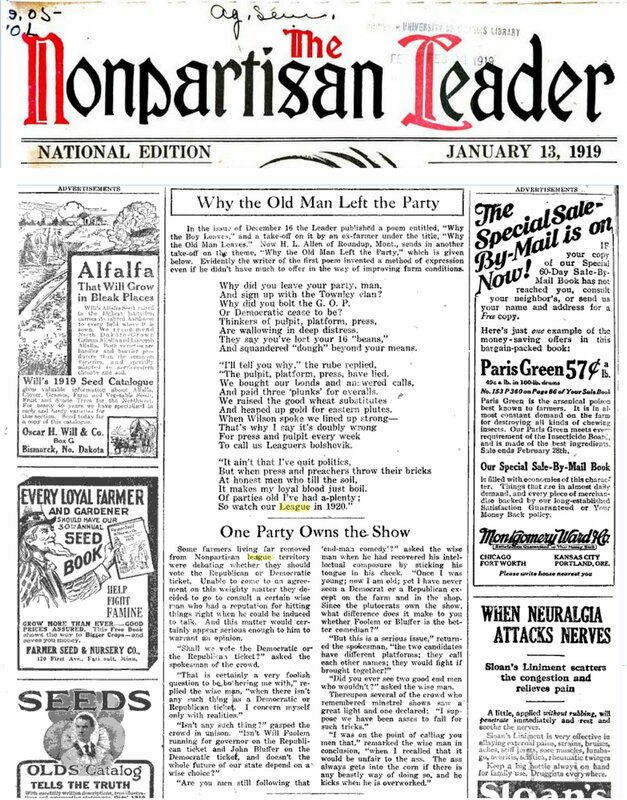 This evening I found that some scans of the League's newspaper, The Nonpartisan Leader, on Google Books. I thought it would be a wonderful Thanksgiving post, which will hopefully encourage more people to read about the League. A number of pages of Robert Morlan's excellent book, Political Prairie Fire, are also available on Google Books. In July 2016, Bill Moyers' website featured the League in an article entitled, How to Make a Political Revolution, which includes an important description of how the League's legacy is still improving the lives of people today. The League was heavily slandered, so be discerning as you research more.